Preheat outdoor grill to medium-high heat according to manufacturer's directions. Stir together beans, corn, drained tomatoes and cumin in medium bowl. Place four 18x12-inch pieces of heavy foil on counter. Spray each with cooking spray. Place 1 breast in center on each piece of foil. Spoon 1/4th bean mixture over chicken for each packet. Bring up short sides of each foil packet and double fold top. Double fold both ends to seal each packet, leaving space for steam to gather. Place packets on grate of covered grill. Grill 15 to 20 minutes or until chicken is no longer pink in centers (165°F). Carefully open packets; sprinkle 1/4th cheese on top of each breast. Close foil and let stand 2 minutes or until cheese melts. Packets may be baked on shallow pan in 425°F oven 20 minutes or until chicken is no longer pink in centers. Or, to save aluminum foil, place chicken in 13x9-inch baking dish sprayed with cooking spray. 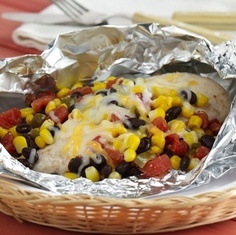 Spoon bean mixture over chicken; cover dish with aluminum foil. Bake in 375°F oven 30 minutes or until chicken is no longer pink in centers.